I went to Thailand recently to learn thai massage, visit some amazing places in nature, have a deep cultural experience, meet new people, and get out of my usual routine and comfort zone. I got all those things out of the experience, but I feel like those were only the tip of the iceberg. I experienced meditating, yoga, and massage surrounded by beautiful natural environments. I met all kinds of different people, each one unique, but they had the same goal of making the world a better place. I stayed in a traditional thai home for a few nights, massaged local health workers, visited a moken island, and roasted cashews. Snorkeling, living in the jungle for a week- these are just a select few of the highlights of this trip, which are far too numerous to go into detail. I really got some amazing things out of this trip. I have confidence that I can go and do whatever I want to. I now have a taste for traveling more areas of the world, and will make sure that happens. My Thai Massage skills went from beginner to advanced, although I also realized how much more there is to learn. I also realise the importance of taking care of your health. A huge lesson for me, is that money has very little to do with wealth. Enjoying life as it happens, eating healthy delicious foods, taking time to take care of yourself through rest and exercise, meeting new people, and having new experiences; these are true wealth, and way more important than being stuck in a life you hate just to make money. My one piece of advice for anyone wanting to travel, but on the fence about it, just put any excuses you have aside , and find a way to make it happen. You may be asking, how does aromatherapy work? Once the aroma enters the nasal cavity, changes occur in the limbic system, a complex biological switchboard in the brain which controls things like memories and emotions. Some ways to use essential oils are, putting a drop or two on the hands (if direct contact with the oil is safe) and inhaling directly, there are also some high quality essential oil diffusers on the market, look for one that does not alter the chemistry of the oils. Some oils can be taken internally, and users have had some incredible health results with that. Do not take oils internally unless the label says it is safe to do so. Many people mix essential oils in ,what is called , a "carrier" oil like almond oil, vitamin e oil, or jojoba oil. You can then massage the oil blend into the skin, and will receive the benefits, as soon as, your body absorbs them ( about 20 minutes). One essential oil blend ,that I use during sports massage, is great for trigger point therapy. I use 4 oz vitamin e oil, and add 10 to 15 drops of lavender, lemongrass, peppermint, and sage. This blend has a high linalool content which , to make a long scientific story short, has been proven to effective in treating myofascial pain! Essential oils have been a passion of mine for the past few years. The benefits are broad spectrum, meaning almost every essential oil has more than one benefit. Many oils such as lavender have relaxing qualities, and users report that it may help with insomnia. Many oils such Rosemary, Cinnamin,Thyme, and Frankincense have anti-inflammatory properties, and research has shown them to be valuable in treating arthritis. Frankincense has been shown to be effective against ulcerative colitis, in fact one research shows 82% of treated patients went into remission. Here is an article on the possible cancer killing effects of frankincense -http://guardianlv.com/2013/07/cancer-treatment-found-in-ancient-resin/. Also resent Israeli research shows lemongrass may be effective in killing cancer cells -http://www.scribd.com/doc/12879711/Israeli-Research-Finds-Lemon-Grass-Kills-Cancer. Also because of the anti-microbial properties of lemon oil, many surgeons are using lemon oil to disinfect their equipment. 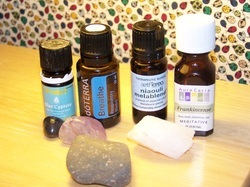 Many essential oils are resistant to bacterial mutation because of their broad spectrum properties. In fact some places in the world, France for example, incorporates essential oils into their healthcare system. In the next blog I will tell you about some of the best ways, to use essential oils, including an awesome blend that I use for sports massage...to be continued. A blog relating to taking care of a very precious resource, your body.- more to come soon!